Synonymy: Hoya lamingtoniae auct. non F. M. Bailey (1898); PNG-4 hort. ; Hoya laurifolia hort., non Decne. 1838); Hoya solaniflora hort., non Schltr. 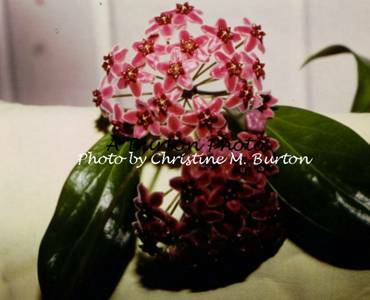 (1913); Hoya vitchii hort. Native habitat: Papua, New Guinea. Plant: Glabrous except for corolla; stalks smooth, woody, with few to no adventitious rootlets; specimens grown by this author showed no tendency to twine. 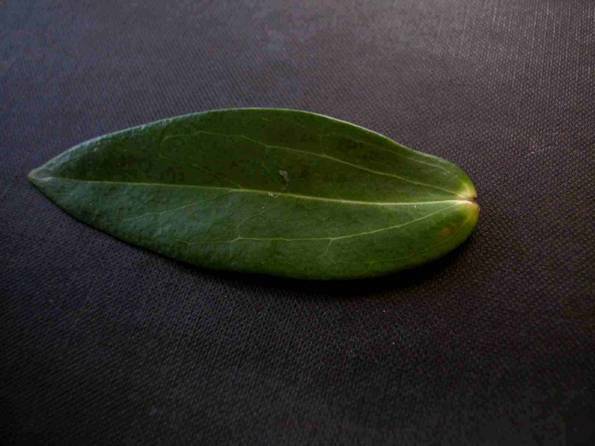 Leaves: Glabrous, elliptic, dark green on top, lighter beneath; rather thin, not at all succulent, @ 5 – 11 cm. long X @ 1.2 – 3 cm wide. Leaf venation: Pinnate, anastomosing, very reticulated. Petioles: @ 3.5 – 5 mm. long, terete . Peduncles: Glabrous, @ 2 – 3.5 cm. long. Pedicels: From 12 to 25 per umbel, glabrous, @ 2 cm. long, all of more or less the same length. Flowers: Calyx – glabrous, each segment a different size and shape. Corolla – Rotate, deep purplish red more or less glabrous in center of lobes but with a broad band of white hairs on the margins; @ 15 – 16 mm. in diameter. In hot weather the corolla is sometimes red with a white or yellowish white border. Corona – As shown below. Burton, Christine M., Hoyan 2(4): 87 (1981). PNG-1 as it frequently blooms in very hot weather. Calyx & carpels: Sepals @ 1.01 – 1.6 mm. long X @ 1.22 – 1.33 mm. wide (each one different); carpels @ 1 mm. tall. Corona above @ 6.6 – 7 mm. in diameter; lobes @ 2.93 mm. long X @ 1.6 mm. wide. Corona profile @ 0.96 mm. tall on @ 1.1 mm. column. Pollinarium @ 0.7 mm. long; pollinium @ 0.56 mm. long X @ 0.214 mm. wide; retinaculum @ 0.2 mm. long. The above hoyas are now being sold as Hoya lamingtoniae. Comparison: PNG-1 (IML-70) vs. Hoya lamingtoniae F. M. Bailey. 1). A tall, dense, delicate, succulent, twiner. 4). Lateral nerves very few. 5). Triplinerved at the base. 6). Leaves glabrous on both sides, pale green. 7). The undersides of the leaves more or less speckled with purple. 8). Petiole 3-4 lines long (a line is about 1/12th of an inch). 9). Peduncle is about 1&1/2 in. long, bearing an umbel of 12 flowers. 10). Pedicels about 1 in. long. 11). Calyx segments ¾ line, narrow. 12). Corolla expanding to a diameter of 8 lines (that is about 1 line short of ¾ inch. 14). Corona-segments under 2 lines long, glossy, cymbiforum, viewed from the underside resembling a small grain of wheat. 1). a. If Bailey meant that the leaves were closely spaced when he described them as dense, he was not describing the PNG-1 that I have grown for a better part of 35 years. The leaves on the plant I know as PNG-1 are rather widely spaced along the branches. b. The PNG-1 I know is NOT in the least bit succulent. It is woody stalked and the leaves are among the thinnest of hoya leaves. c. The PNG-1 I know is not a twiner. I have to deliberately twine the young shoots around a support and tie them in place. 2). a. All the mature leaves I’ve seen on PNG-1 are from 4 up to 5 inches long and from ½ to 1&1/2 inches wide and lanceolate-elliptic in shape. Most are about 4 inches by just under 1 inch. Some are acuminated and some just acute; some tips are straight and some tips are curved into a comma-like shape. b. All the leaves on the PNG-1 I know are dark green on top; lighter green beneath..
3). The gland at the base of the leaf where it is attached to the petiole on the plant I know as PNG-1 is so tiny and so deep that I can’t see it but I can feel it. 4). The lateral nerves on the plant I know as PNG-1 are what I know as “reticulate.” There are lots of them. They are not at all conspicuous but they are visible without magnification. When the leaves are dried they appear raised and show up extremely well. 5) . I have never seen a leaf on the plant I know as PNG-1 that has triplinerved leaves. All are pinnate or, to be more accurate, the nervation is “camptodromus” (See Stearn, 4th edition, page 524) and anastomosing..
6). I agree in part with this. All the leaves I’ve seen on PNG-1 are glabrous on both sides but all the leaves I have seen on this species are very dark green..
7). The plant I know as PNG-1, which I’ve grown for more than thirty years has never had a speckle of any colour on it. 8).The petioles on the plant I know as PNG-1 are about the length described by Bailey. 9). a. The peduncles on the plant I know as PNG-1 vary, as do the peduncles of almost all the hoyas I’ve ever grown. The only one I’ve measured is the first one I saw. It was 1 inch long. The only hoyas I’ve grown that consistently have uniform sized peduncles are bella, lobbii and polyneura (those appear to be very uniform but other species aren’t). b. When the plant I know as PNG-1 bloomed, it had from 17 to more than 20 flowers per umbel. 10). The pedicels on the plant I know as PNG-1 are, as Bailey said, about 1 inch long. Those of PNG-4 somewhat longer. 11). Calyx segments on the plant I know as PNG-1 are more or less triangular in shape, broad at the bottom, narrow at the top and no two are exactly alike nor the same size. I’ve examined them from at least 100 flowers at different bloom seasons and every calyx I’ve seen has 5 differently shaped sepals. 12). & 13). What I’ve observed agrees with these. 14).The corona lobes on the plant I know as PNG-1 are almost two times longer. 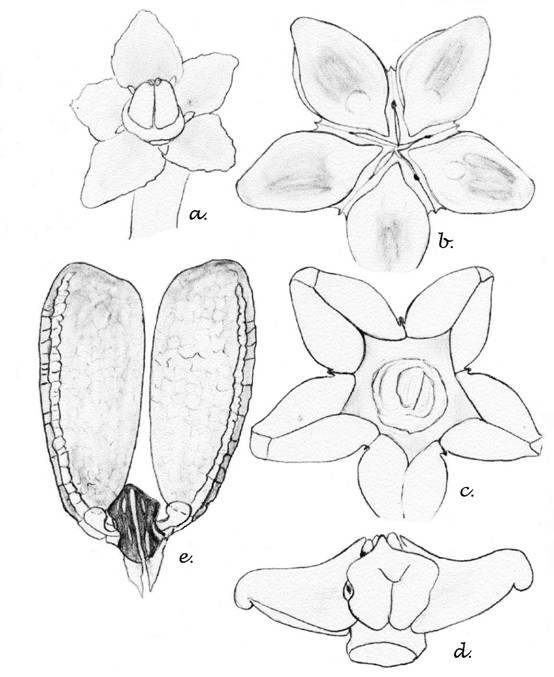 The above is reputed to be the holotype of Hoya lamingtoniae F. M. Bailey, however, it appears from notations on it, to have been designated holotype long after the publication of this species name. This makes me very doubtful of its authenticity. It has Bailey’s card on it which says it is Hoya lamingtoniae but the card at upper right signed by someone whose name appears to be “Bolin” says it is “Part of the Type Collection.” One wonders, “What part” and if the rest of the type collection might prove that two or more species may have been mixed here? There is a third card attached here, signed by someone named Fredin. Both of the two cards claiming this to be Holotype and “Part of the Type Collection” are dated 1981 (at least that is what the dates appear to me to be). I don’t think that F. M. Bailey was still living in 1981 so, it seems to me that the determination that this is a holotype is pure conjecture. Bailey’s card does not make that claim and he did not, in his publication of the name, cite a collection number. In fact, it wasn’t until about 5 or 6 years after this publication that the Code was adopted. 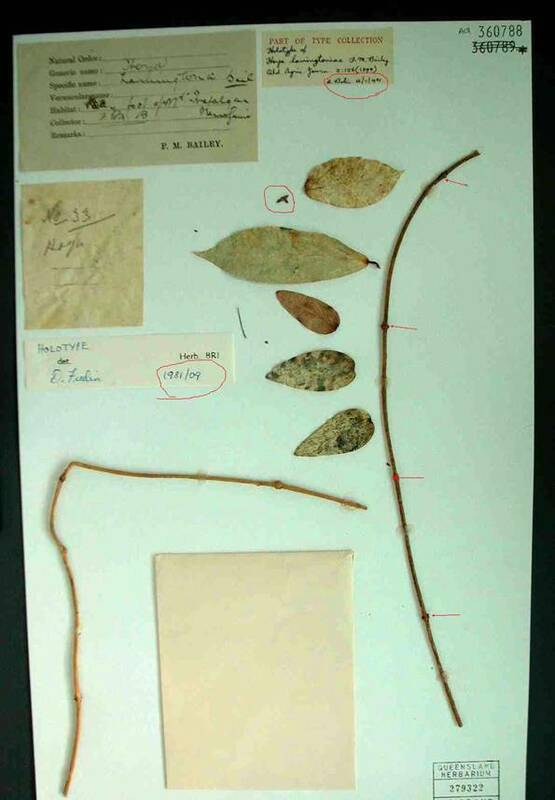 Prior to that holotypes were not required and most publications were rather vague as to which specimens they had deposited in herbaria or where those herbaria were. .
Also, I wonder, since Bailey, in his description, did not specify a type (not required then) how one can label this a holotype. The Code says that no one can name a holotype after the date of the original publication --- one can only designate a lectotype. Note that all 5 of the leaves are detached. There is only one leaf (2nd from top) that in any way resembles any leaf I ever saw on PNG-1. Note that this leaf DOES NOT have trinerved veins and that it has a lot of reticulations which Bailey said were missing on the leaves of Hoya lamingtoniae. This makes me suspect that this leaf belongs to a different species than the other four leaves. 1). The arrows point to the leaf nodes on the leafless stalk. I am making an educated guess that this specimen is about 14 inches wide by about 18-20 inches long. Most of the herbarium specimens I’ve seen fall inside those limits. This specimen doesn’t have a scale anywhere on it, as many do so, without seeing the actual specimen, I can’t say exactly what true measurements are, however, I’m sure my estimates will be close. You will note that F. M. Bailey described Hoya lamingtoniae as “A tall, dense, delicate twiner. I can think of nothing that would qualify it as “dense” except closely spaced leaves. Note the red arrows in the above picture. Even if one doesn’t enlarge the picture to true size, those leaves are quite widely spaced. My estimate, based on average herbarium specimen size, is that the nodes are about three inches apart. That isn’t dense. There is one internode on the bent stalk at bottom left that (based on same premise) measures nearly 4.5 inches long. 2). Bailey described triplinerved at base. I see zero tri-nerves and zero tripli-nerves anywhere on this specimen. Since nerves show up better on dried specimens than on fresh leaves, I’d expect to see them but I don’t. Maybe I would if I saw them reproduced life size but when I zoom in closer on this picture there is too much distortion to know what is a nerve and what isn’t. One thing I know and that is that PNG-1, PNG-4 and Ted Green’s “Hoya laurifolia” never sported a single leaf with trinerved or triplinerved leaves. This leaf picture was sent to me by David Liddle. I understood him to say it was a Hoya lamingtoniae leaf. It is labeled “DSCN0010.” This leaf looks as Bailey described the leaves of Hoya lamingtoniae except for one thing. It doesn’t have triplinerved leaves. It has quinquenerved leaves. The basal nerves, however do not run in the same direction as those in the leaf at the top on the specimen, which is the only one whose nerves are clearly visible. It doesn’t at all resemble the hoya I purchased (three times) from Ted Green as PNG-1 and once each as PNG-4 and Hoya laurifolia.. In its shape it resembles 4 of the leaves on the so-called holotype specimen (except I see quinque-nerves here and don’t see them on that specimen). Bailey made no mention of that light coloured leaf base. 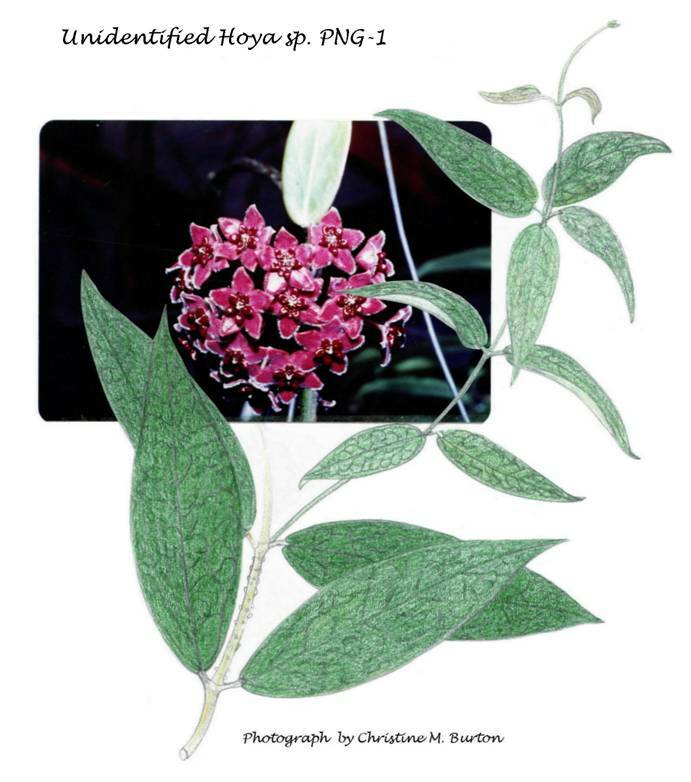 Those 4 egg-shaped leaves on the specimen look a lot like Schlechter’s Hoya rubida type. This makes me suspect that Hoya rubida may be a synonym for Hoya lamingtoniae. The above is not a PNG-1 leaf! It may be a Hoya lamingtoniae leaf! I really don’t know! Re the corona lobes on the specimen. They don’t appear to match PNG-1 to me. But then again, they are so small in the picture and distort so much when I try to blow them up that I can’t even tell if they are corona lobes or just little sticks off plant stalks. They appear much more sharply pointed at the ends than those I’ve seen. 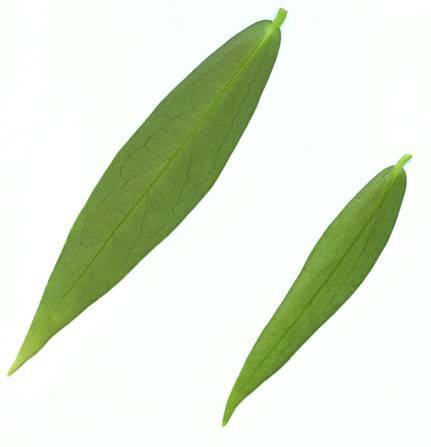 The above are two leaves of PNG-1. These are the undersides of the leaves. I scanned the undersides because the upper sides are so dark a green as to appear black when scanned. That darkness of colour completely soaked up the veins so they didn’t show in scan although I could see them easily with my eyes. 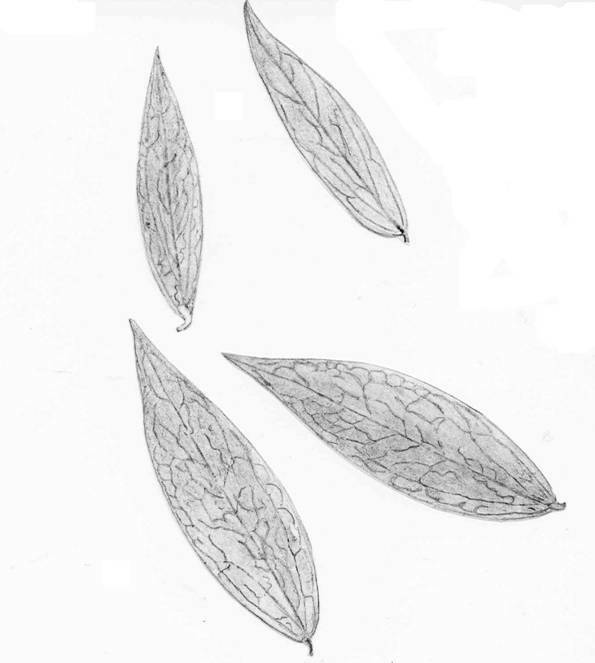 Note that Bailey said that the only visible veins were the three at the leaf base, which he said were “triplinerved.” Trinerves arise at the base. Triplinerves’ two lateral nerves arise slightly above the base and run almost parallel to the costa, nearly to leaf tip). As with all pinnate leaves, there are two nerves (one on each side of costa) that rise upwards but they are not described as triplinerved unless 1). They run almost parallel to the midrib nearly to the leaf apex .The basal nerves on these leaves curve and join the second pair of lateral nerves; then the second pair of lateral nerves travel upward and outward, then curve in and join the third pair of lateral nerves. This is described as “anastomosing”, i. e., united by running together irregularly to form a network. I believe that this proves that PNG-1 is NOT Hoya lamingtoniae.